Touring Egypt 32: One of nature’s most unusual animals looks like a plant. Divers see these all over the world’s oceans, but we usually don’t think too much about it. Our eyes see a crinoid, and we automatically think of it as a plant. It has roots, branches, and feathery fronds. It has no obvious mouth or eyes. But in reality, it is an animal. It hunts and it moves. Especially at night. There is so much to see on the reef at night. 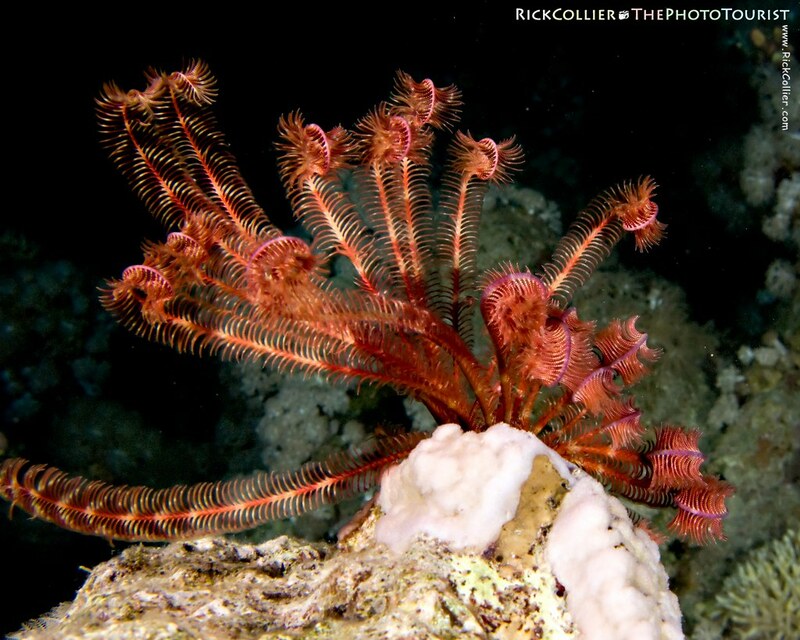 On this dive, I didn’t even notice the crinoid (also sometimes called “feathery star fish” or “sea lily”). Drifting along at about 60 feet, looking down the focused beam of my dive light, I was pursuing a shy common lionfish. I passed by the “plant” on the rock, focused on my quarry. Having gotten that shot, I turned back and noticed something had changed. The “plant” was gone. I swept the reef with my light and there, on the next rock over, I saw my bright red and orange “plant,” fronds curling and uncurling languidly in the passing current. Skewered in my bright dive light, it suddenly extended its “roots” and slithered quickly out of the beam, “jumping” off the rock. Creepy. This entry was posted on Wednesday, October 21st, 2009 at 18:12 PM. It is filed under thePhotoTourist, Underwater and tagged with coral, coral reef, crinoid, destination, dive, diving, Egypt, feather star, feather starfish, Paradise, Red Sea, reef, scuba, sea lily, Sharm, Sharm al-Shaykh, Sharm el-Sheikh, Underwater. You can follow any responses to this entry through the RSS 2.0 feed.